Fire alarm testing is a top priority when it comes to the maintenance and safety of your building. It’s crucial to schedule professional fire alarm tests and inspections to ensure your system remains reliable and in optimal condition. Testing and maintenance not only prevents dangerous situations, but it also helps reduce the expense of costly emergency repairs. Depending on the equipment you currently have, your fire alarms should be tested on an annual, semi-annual, or monthly basis. For more information on fire alarm inspections, what needs inspected, and when you need to schedule your testing, check out the National Fire Protection Association’s (NFPA) list of NFPA codes & standards. Frontier Fire Protection provides fire alarm testing among many other services. Below is the checklist of the inspections we can provide during our scheduled testing. Visual inspection and functional testing of fire alarm control panel components and power supplies. Visual inspection and functional testing of remote power supplies (when applicable). Load testing of fire alarm system and remote supply standby power batteries. Visual inspection and functional testing of automatic and manual alarm initiating devices. Visual inspection and functional testing of audible and visual notification appliances. Visual inspection and functional testing of emergency two way communications systems (when applicable). Verification of alarm signal transmission to central station (when applicable). Visual and functional testing of remote system annunciators (when applicable). Verification of graphic map device locations (when applicable). Functional testing of door releasing relays. Documentation of system testing and when applicable generation of system deficiencies report. Contact Frontier Fire to schedule your fire alarm testing. 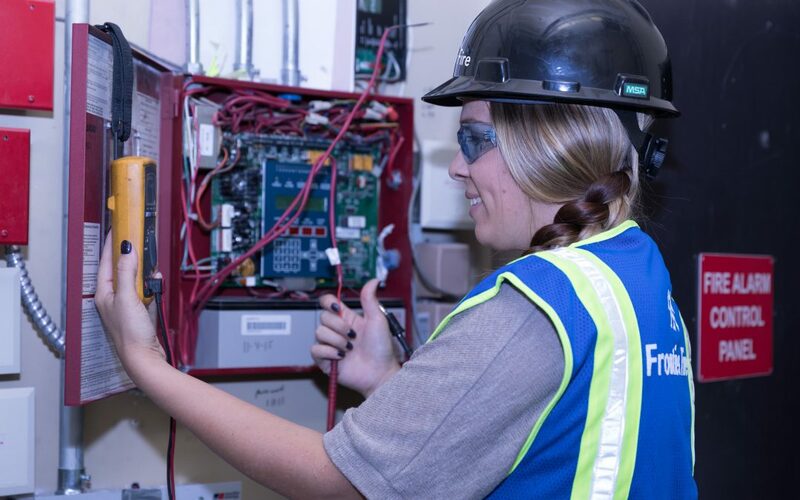 As Colorado’s leader in protection systems for over five decades, we offer a full range of fire alarm services including design, installation, inspection, maintenance, and emergency response. We also offer fire sprinkler and backflow services as well. Give Frontier Fire a call today at (303) 629-0221 to schedule your fire alarm test.